The unbundling of open education resources offers flexibility but also chaos. We are seeing a drive toward the unbundling and customization of content for different learners, motivated by a desire for flexible pathways, competency-based learning, and adaptive personalized learning. This desire is driven in part by the existence of a wide-ranging body of learners, many looking to personalize their higher education learning experiences. It is driven in part by the need to improve the efficiency of education, ensuring that learning pathways lead to valuable skills (Lumina Foundation, 2016). And it is driven in part by the growing push towards adaptive and personalized learning (Brown et al., 2015; Cheek, 2015). But while unbundling is a powerful idea, simply chopping up resources can easily result in lost value. Unbundled resources are flexible, but only by eliciting their interconnections can we unlock true value. The drive toward customizing learning experiences precipitates an urgent need to curate learning resources, to identify connections amongst resources, and to identify value-added groupings. Achieving this in a flexible, learner-driven manner is a challenging task—the complexity of the relationships within educational datasets cannot be captured linearly or statically. Attempts to do so risk losing the information and value that are inherent in these large, complex, and dynamic datasets. Instead, we need new approaches to explore and structure these complex webs in education. Digital maps have changed our lives. Whether we are searching for directions to get from place A to place B, searching for restaurants near us, looking at traffic, or just browsing the map to get the lay of the land, digital maps provide us with richly visual, informative, interactive experiences. Digital maps let us search in context. They let us search to see what is “nearby,” even when we don’t know exactly what we may be seeking. They provide us with analytics and options to customize our routes, to make them more efficient or to make them more scenic. We envision digital educational maps as a foundation for the future of open education. Navigating the modern educational landscape shares many parallels to navigating the physical world: learners are often trying to get somewhere (e.g., a job, a certification, or a set of marketable skills), they may want to know what topics or skills are “nearby,” and they may want to know what kind of roadblocks they may encounter along the way. It is hard to imagine navigating the physical world without a map, yet every day learners navigate the educational world in just such a manner. The idea of mapping has taken hold in other digital domains; for example, in online networks such as the LinkedIn Economic Graph, mapping is central to enabling deep analysis of connections amongst people and jobs (LinkedIn, 2016). The idea of mapping in education is not new. For example, concept maps were drawn in the 1980s as teaching tools, and curriculum maps have been used to document relationships among the components of a curriculum (Harden, 2001; Hausman, 1974; Jacobs, 1997; Wandersee, 1990). Like the printed maps of yore, these have taken the form of static diagrams, drawn once to capture a snapshot in time, or created as once-only visualizations depicting a particular data set. Sometimes, these “maps” have been lists and tables. This has sufficed for one-off implementations, but it is insufficient in our digital age, where big data such as MOOC learner and interaction data can number in the trillions of points, shift daily, and enable deeper analysis beyond simple linear comparisons (Breslow et al., 2013; Kay et al., 2013; Reich, 2015). In the modern era of digital technology and big data, an educational “map” could and should be a richer visual, interactive experience. A cartographic view of educational data emphasizes the relationships among the data. In many cases, an explicit representation of these relationships is entirely neglected. In other cases, the relationships may be documented, but not in an organized, scalable form that can be automatically parsed. For example, learning outcomes, which define what learners will know or be able to do as a result of a learning activity, are being widely adopted as a valuable way to structure educational programs. Yet the emphasis has been on creating lists of learning outcomes, typically organized by classes or degree programs, without paying attention to the relationships among the learning outcomes. By specifying the prerequisite relationships among outcomes, our work builds an outcome map, which in turn enables identification of the learning pathways that link together related outcomes. Figure 1 shows such an outcome map, built as part of the Xoces project, which catalogs, structures, and visualizes learning outcomes within a curriculum. We have used these outcome maps to help document student learning pathways at various institutions and to support curriculum planning discussions (Seering et al., 2015). Figure 1: The Xoces project builds visual interactive maps of learning outcomes across a curriculum. Educational cartography is a complete, structured analogy. Beyond just generating a visual representation of educational data, the analogy of educational cartography encompasses the entirety of mapping, including the collection of data, the analytical processes of data mapping, analysis, and delivery, and the design and generation of interactive visual maps. In the realm of the geographical information sciences (GIS), surveying is the art and science of determining the positions of and distances between points, the first step of mapmaking. An instructive analogy can be made: within what we can call the educational informational sciences (“EIS”), surveying the educational data set allows us to determine the nature of what is being mapped—for instance, which entities are defined as points, what relationships can be defined as “roads” or pathways between points, and what clusters or “suburbs” of points may exist. Once this topology of the space has been surveyed, interesting questions can be asked of it. This process of surveying the data constructs a surveyed data set that is a necessary input into creating digital educational maps, and itself is of high value in analytics. As another example, the guided pathways model espoused by Bailey, Jaggars, and Jenkins (2015) explicitly highlights the need for maps. These can be maps showing the paths to a degree, maps showing prescribed sequences of courses, etc. 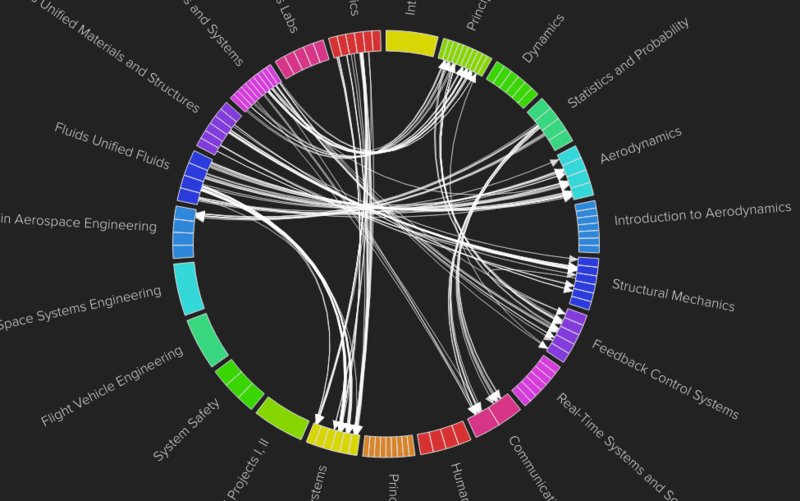 Such a curriculum map, highlighting open educational resources on MIT OpenCourseWare (MIT OCW), is shown in Figure 2. This map demonstrates the advantages of visual mapping over linear lists in its ability to highlight complex prerequisite sequences of subjects within an entire curriculum. 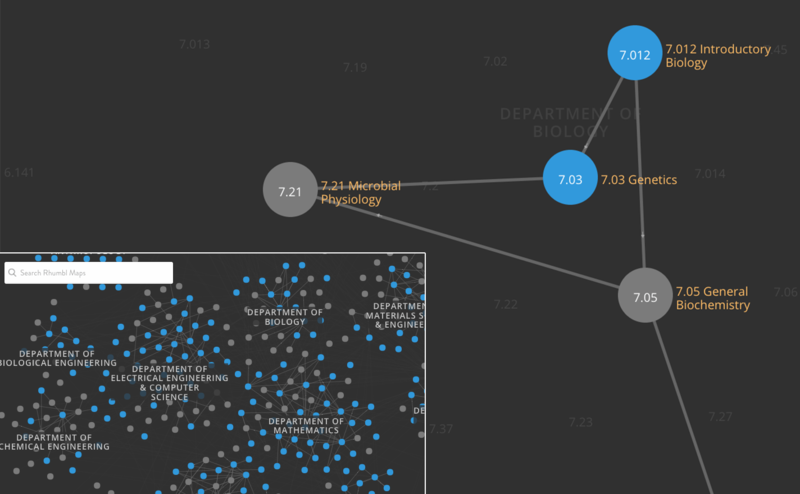 The map highlights key connections across departments, and also enables the user to perform data analytics through highlighting the subjects offered on MIT OCW. Figure 2: An interactive, searchable curriculum map highlighting open educational resources on MIT OCW and their prerequisite pathways. Mapping is our way to educational innovation. The advent of big data in education is a tremendous opportunity, one that will empower a data-driven future for open education. But to get to that future, we need structured approaches to educational mapping. It will not be enough to simply generate visual representations; the surveying of data, and ultimately making data-driven decisions based on the resulting data analytics, will also be necessary. The approaches offered by the analogy of educational cartography can put the power of exploration and wayfinding in the pocket of every learner and every educator, unlocking innovative practices for the next generation of open education. Bailey, T. R., Jenkins, D., & Jaggars, S.S. Redesigning America’s Community Colleges. Harvard University Press, 2015. Breslow, L, Pritchard, D.E., DeBoer, J., Stump, G.S., Ho, A.D., & Seaton, D.T. “Studying learning in the worldwide classroom: Research into edX’s first MOOC.” Research & Practice in Assessment, Vol. 8, 2013. Brown, M., Dehoney J., and Millichap, N. “The Next Generation Digital Learning Environment.” Educause Learning Initiative Paper, April 2015. https://net.educause.edu/ir/library/pdf/eli3035.pdf. Harden, R. M. “AMEE Guide No. 21: Curriculum mapping: a tool for transparent and authentic teaching and learning.” Medical Teacher, Vol. 23.2, pp. 123-137, 2001. Hausman, J.J. “Mapping as an approach to curriculum planning.” Curriculum Theory Network, Vol. 4, No. 2-3, pp. 192-198, 1974. Jacobs, H.H. Mapping the Big Picture. Integrating Curriculum & Assessment. K-12. Association for Supervision and Curriculum Development, Alexandria, VA, 1997. Kay, J., Reimann, P., Diebold, E. and Kummerfeld, B. “MOOCs: So Many Learners, So Much Potential…” IEEE Intelligent Systems, Vol. 28, Issue 3, pp.70-77, May-June 2013. The LinkedIn Economic Graph, https://www.linkedin.com/company/linkedin-economic-graph. Accessed March 20, 2016. Lumina Foundation, Corporation for a Skilled Workforce (CSW) Center for Law and Social Policy (CLASP). “Connecting Credentials.” January 2016. https://www.luminafoundation.org/resources/connecting-credentials-lessons-from-the-national-summit. Reich, J. “Rebooting MOOC Research.” Science Vol. 347, Issue 6217, pp. 34-35, December 2015. Seering, J., Huang, L. & Willcox, K. “Mapping Outcomes in an Undergraduate Aerospace Engineering Program.” Proceedings of the American Society for Engineering Education, 12th Annual Conference & Exposition, June 2015. Timelapse Project, Time Magazine. http://world.time.com/timelapse/. Accessed March 20, 2016. Wandersee, J.H. Concept mapping and the cartography of cognition. Journal of Research in Science Teaching, Vol. 27, Issue 10, pp. 923-936, 1990. This work by Karen Willcox and Luwen Huang is licensed under a Creative Commons Attribution 4.0 International License.